also ensuring IT compliance—by auditing permissions. Why should you audit share and NTFS permissions? According to Verizon's Data Breach Investigation Report, privilege misuse caused 14 percent of all data breaches in 2017. When employees have excessive rights, they can gain inappropriate access to files or folders, potentially exposing or modifying mission-critical data. This elevated access could put an organization at risk of losing all its data, forcing it to face hefty penalties for non-compliance. Knowing your employees' effective permissions will help you avoid data breaches and fines for non-compliance. However, staying on top of your employees' permissions means using a Windows file permissions tool that audits, analyzes, and reports on a user's access rights and effective permissions. With the right permissions auditing tool such as DataSecurity Plus, you can easily verify whether your employees have only the authorization they require for their work. View users' access rights by auditing share and NTFS permissions. Find their assigned file access rights and inherited permissions. Track permission changes in real time. 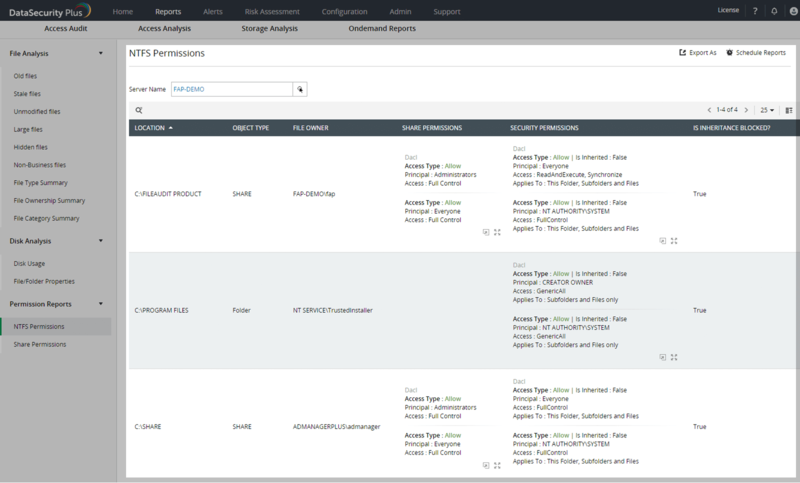 Spot possible instances of privilege escalation with real-time alerts for critical events such as permission or ownership changes. Scan for elevated privileges instantly. List your employees' access rights and spot overexposed data. Ensure that they only have the permissions they need for their work. 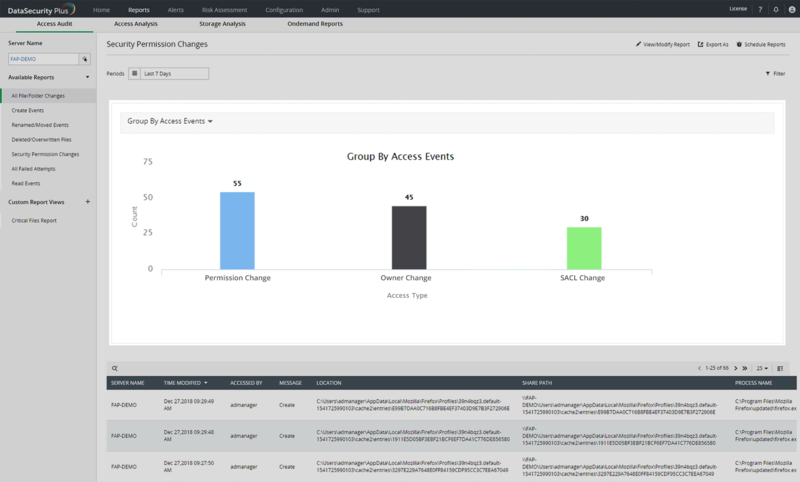 Determine the effective access permissions of multiple users or groups in one go with instant, accurate reports. Simplify NTFS and file share auditing with DataSecurity Plus. and shared folder permissions tool. 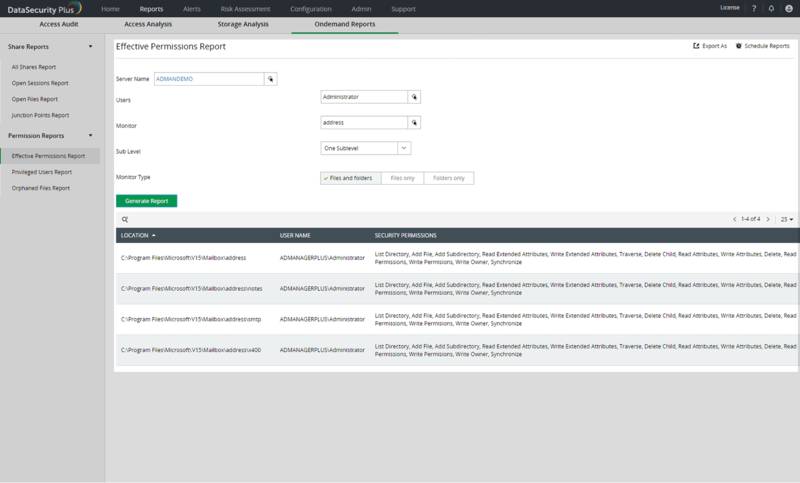 Identify inappropriate user activities faster by auditing all permission and ownership changes on your file servers. 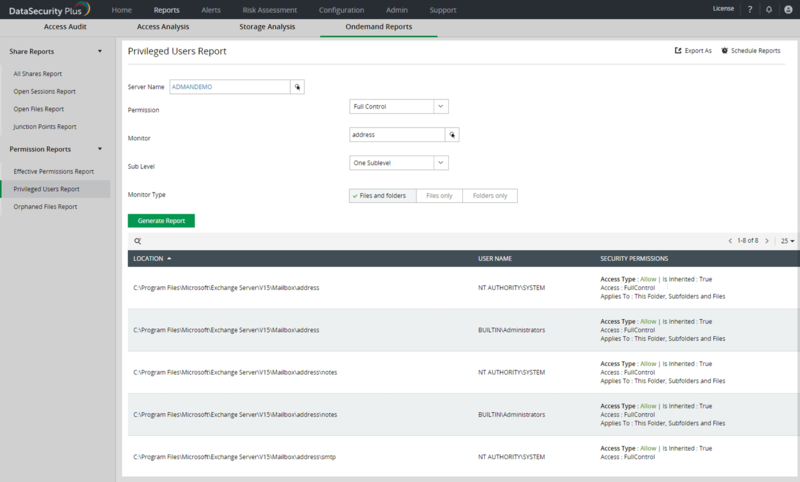 Get full visibility across your file servers by viewing all user access rights. You can easily see the permissions assigned to shared and local folders with the Windows file share permissions audit utility. Generate instant, detailed, and accurate reports showing the effective permissions of multiple users. Make sure no user has more privileges than needed. Detect any instances of privilege misuse or other anomalous accesses by monitoring the activities of users who have privileged access.